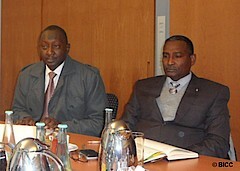 From 10 to 15 December, a delegation from Sudan comprising representatives from the Disarmament, Demobilisation and Reintegration Commission, Ministry of Interior and civil society met with different UN Agencies, German government institutions and think tanks specialised in small arms control and disarmament. BICC experts accompanied the delegation on this study visit. The members of the delegation lead by Abdel Aziz Malik Mohamad Ahmad, the National Focal Point on Arms Control, Ministry of Interior, were welcomed by the Secretariat of Geneva Declaration on Armed Violence and Development and Small Arms Survey in Geneva. During the one-day meeting the participants and the presenters had a lively exchange on international regimes such as the Programme of Action on Small Arms and Light Weapons (PoA) and Arms Trade Treaty (ATT),as well as issues related to physical security and stockpile management. The second day was hosted by the UNDP’s Bureau for Crisis Prevention and Recovery and UN Institute for Disarmament Research. The members of delegation relayed national achievements on arms registration and marking, and gave a briefing on the new regional small arms and light weapons control (SALW) initiative, the “Khartoum Declaration”. UNDP colleagues shared their best practices of regional initiatives in the area of armed violence reduction and regional cooperation on SALW control based on the experiences of South Eastern Europe and Central American. The delegation also had an engaging dialogue with the UN Office on&Drugs and Crime via video conference, where fields of cooperation on cross border anti-proliferation of fire arms were explored. During the meetings the participants also broadened their knowledge on methodologies of research development and the conduct of surveys in relative areas. 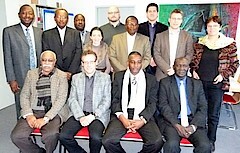 After the two day intensive programme in Geneva, the delegation proceeded to Germany. 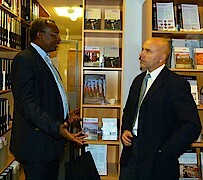 At the Federal Foreign Office in Berlin they met with representatives of the Sudan Desk, Directorate-General for Disarmament and Arms Control and for Economic Affairs and Sustainable Development. The next stop was the German Parliament, where Joachim Spatz, the Chairperson of the Subcommittee on Civilian Crisis Prevention, welcomed the delegation and exchanged views with respect to disarmament and reintegration opportunities of former combatants in Sudan. 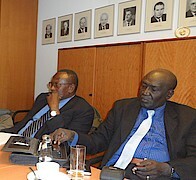 On 15 December BICC hosted the delegation at its premises in Bonn. Jan Grebe, Michael Ashkenazi and Marius Kahl gave short input presentations and a lively discussion evolved around the topics: German arms export, international regulatory mechanisms on arms trade, and illicit weapons proliferation. The participants also had the opportunity to visit the Technical School on Land Systems of the German Armed Forces in Aachen. The delegation was accompanied by Ada Hakobyan and Marius Kahl, technical advisors at BICC. The one-week study tour was organised within the framework of the BICC capacity development project to Sudan Disarmament, Demobilisation and Reintegration Commission (SDDRC) and funded by the German Federal Foreign Office.